With Wild Rock located in the heart of the Kawarthas, we are surrounded by endless amazing places to ride a bike. It should come as no surprise that many of our staff are dedicated cyclists who love nothing more than getting out on their bikes every chance they get! Wild Rock is a full-service bike shop as well as great place to shop for a new bike or those accessories you need for your next ride. Our brand partners Trek, Bianchi, Shimano, Pearl Izumi, Salsa, Santa Cruz, Bontrager, Thule (to name a few) are dedicated to providing top quality products that we are proud to stand behind. Working with our staff is a personal experience, one in which we take our time to help you find just the right bike, the perfect short, or that key accessory. Get to know more about the folks you will see when you walk in our doors, and their favourite cycling products you can find at Wild Rock. Tori is our women's cycling expert and community advocate. Tori is one of the faces you will see most days at Wild Rock - on the sales floor, in the shop, but sometimes you will find her overseas leading our cycling trips.. When she is not helping you find just the perfect bike or piece of gear, Tori is busy running our community bicycle repair clinics, teaching you the secrets of keeping your bike running smoothly. "well I do love new and flashy gear, I really appreciate equipment that simplifies things, works really well, and you enjoy every time you use it. On that end, I love products from Silca. They work so well, will last a long time, and they look great too. The Pista pump is the standout. For bikes, I love the versatility of the growing gravel segment - and for that, you can't beat the Salsa Warbird - one bike to do it all." Jamie is our Department Manager and Buyer, and digital marketing guy. Jamie has been kicking around bike shops since he was a dirt loving 15 year old. You will find him most days on the road and cross bikes, but he makes the return to the trails every now and then! At Wild Rock Jamie brings in all those cool bikes and gear that you love to shop for, and is always on the hunt for the next new trend, and a flashy pair of cycling socks. "As much as I do love new and flashy gear, I really appreciate equipment that simplifies things, works really well, and you enjoy every time you use it. On that end, I love products from Silca. They work so well, will last a long time, and they look great too. The Pista pump is the standout. For bikes, I love the versatility of the growing gravel segment - and for that, you can't beat the Salsa Warbird - one bike to do it all." 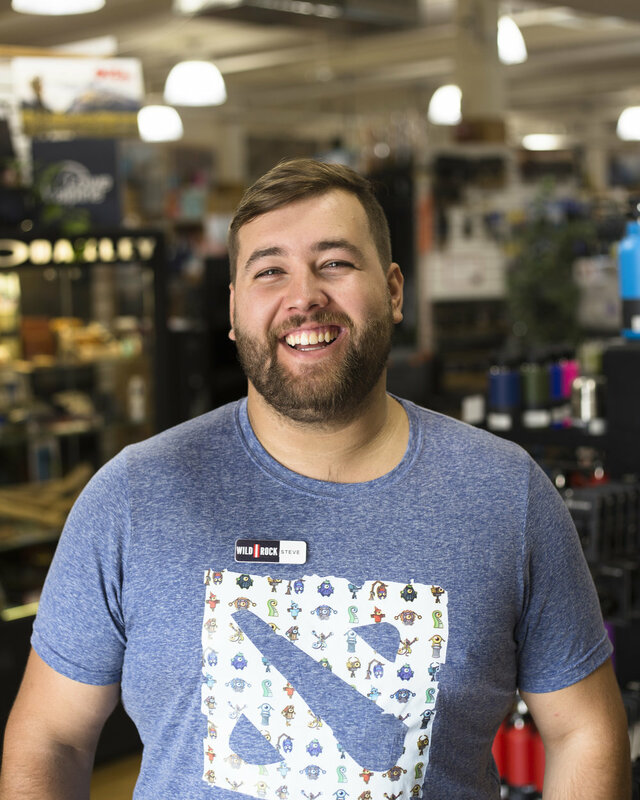 Isaac is our events coordinator as well as one of our core camping staff here at the store. You’ll most likely see his face out hiking in Algonquin Park or out in the community hosting events. if you have been down to our service department to have your bike repaired chances are you have worked with Macarthur. Mac is our head mechanic and brings a great wealth of knowledge and lots of TLC to every bike that hits his workstand. Got an old 3 speed internal hub? Maybe a Di2 superbike? Don't worry - Mac has you covered.